Company uniform handling process is conducted to managing company uniform to maintain discipline and product safety within workplaces. Company uniform handling process is describe to management of company uniform for each employee working in company to maintain discipline for each units and also in case the product needs safety during the manufacturing / producing or handling materials and needs to care for product safety. For food manufacturing company always conducting uniform system and its necessary for standard system and also government rule to each employee working in company and dealing with raw materials to finish product or any part of processes that should be must fulfill requirements of uniform to safe the product and also its good sign identification with individual safety and also maintain discipline in company. 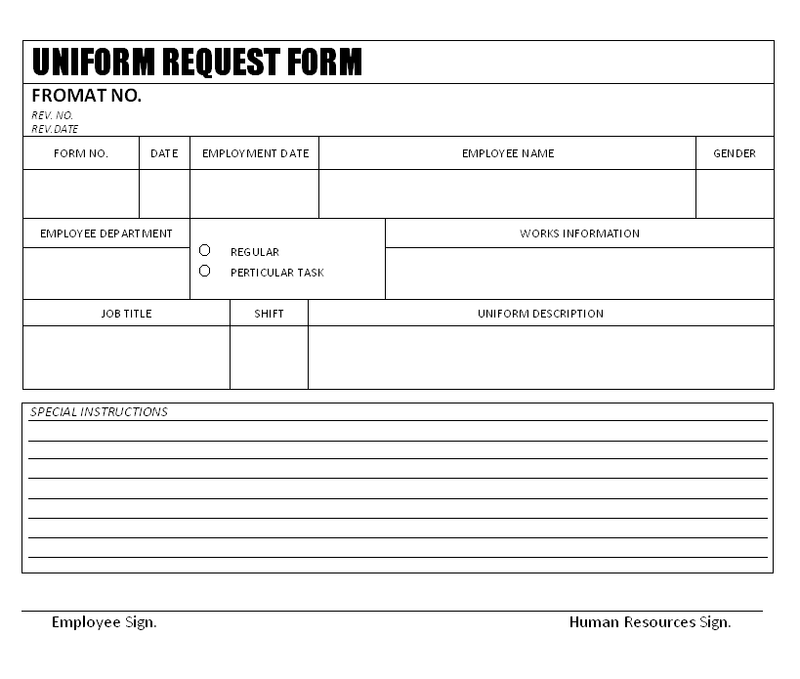 Uniform request form is application to demand uniform for regular and special task that human resource is allocate in line with application, the system is maintained for each employee of company. Each employee and visitors should wear uniform as appropriate requirements to dealing with product or visiting at place of production lines. In case any employees change the department or on completion on special task that uniform should be returnable in those cases. The inform is not just a only part of discipline but also the complied requirement of identity, on base of uniform each department’s employee are identify as per uniform color, Identification number and other details. Company is managing all uniform details and records; human resources department is managing registers and applications for record purpose.